An Oxford Companion to the Romantic Age: British Culture 1776-1832, Iain McCalman, general ed. ; Jon Mee, Gillian Russell, Clara Tuite, assoc. eds. 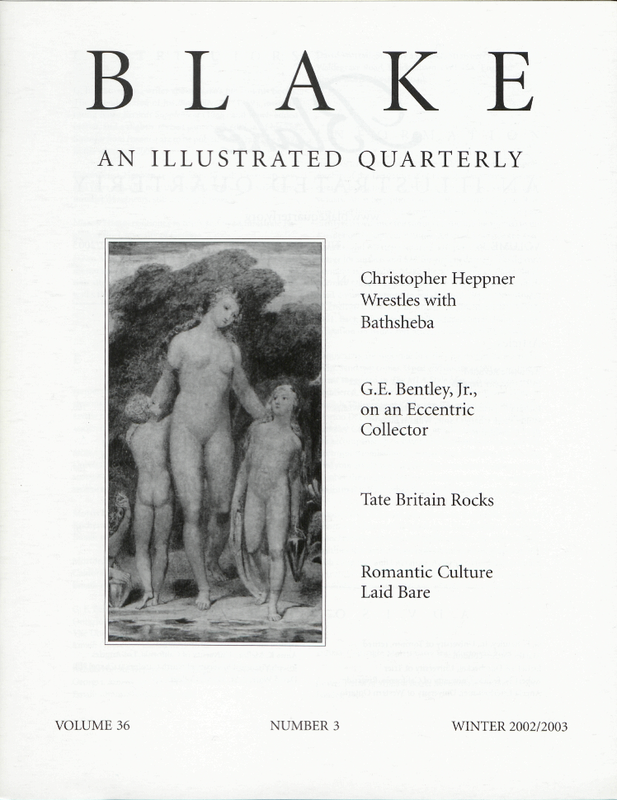 G. E. Bentley, Jr., writes about Blake’s life and his books. The second edition of his Blake Records (1969), incorporating Blake Records Supplement (1988) and much added matter, and a slightly revised paperback edition of his The Stranger from Paradise are to be published by Yale (they say) in the winter of 2003. Christopher Heppner retired from McGill University several years ago, and now thinks and occasionally writes on a number of subjects, still including Blake. Nelson Hilton continues to teach and to administrate English at the University of Georgia. David Minckler has been an admirer of Blake since his master’s thesis in the early 70s. He continues to work on a web site (www.blakewalk.org/main.htm) tracing Blake’s walks through London. Cover: Detail of William Blake, Bathsheba at the Bath. © Tate, London 2001.